The sun was shining this morning so I was inspired to go out and “do stuff” in the garden. Weekend after next, the garden guys are coming to “Roundup” all the weeds, then the following week they will be doing all the digging etc. We have some old perished weed membrane under a layer of gravel which is all going to be replaced because basically everything is just growing through it now. There are quite a few self seeded lavenders down there so I wondered if I could dig them up and put them into pots to save them. Unfortunately the soil is so compacted and the roots have melded themselves with the membrane so this wasn’t possible without damaging them so I took some cuttings instead. I’ve no real idea what I was doing but I did it using a vague memory of seeing Monty Don do it on Gardener’s World a few weeks ago (so I’m probably doing it far too late!). I only did 4, as I also have the other lavenders I got recently. Looks like one of the dodgy ones is picking up again so I might get 5 out of 6 after all. I then noticed some runners on my strawberries so filled some small pots with compost and tucked the runners in to root. I did a bit of trimming and pulling bindweed through the fence from the garden behind us! I collected all the dried lavender flowers too to put into my handmade soaps. And I watered the compost bin because it was very dry. I am a first time composter and I don’t think I’m getting it right at all! Finally I sowed some mixed salad leaves and radishes in containers for a last of the season bit of summer greenery. Then as I was finishing off I noticed this nestled amongst the weeds that have grown on a pile of soil left over from the building work….. 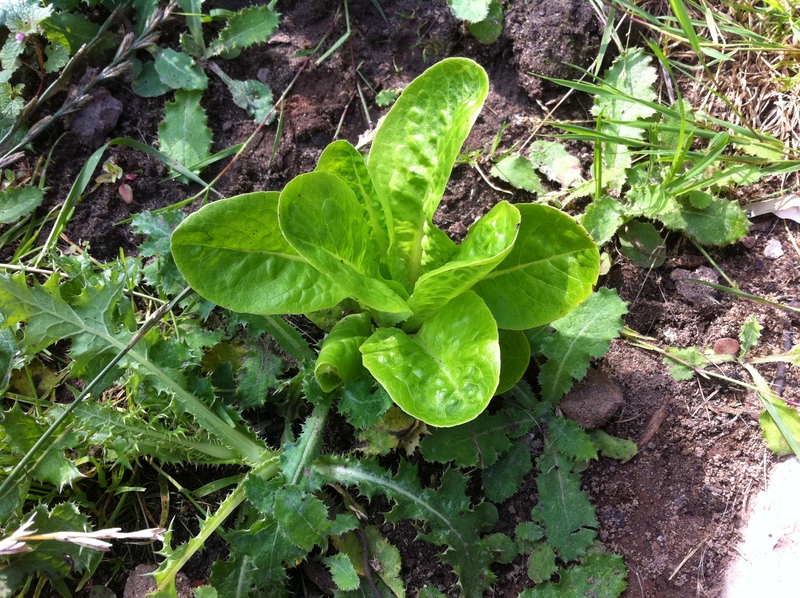 I was pretty sure it was a lettuce but I double checked with the UK Veg Gardener’s forum for confirmation. I can only think that a seed blew down there when I sowed the last batch of salad leaves in a pot on the corner of the patio. I’ll leave it until the guys come and then cut it just before. I’m amazed it has survived any kind of slug or snail attack. I don’t think that there’s generally a right, or wrong, way to compost just plenty of variations. I think you’ll be pleasantly surprised when you do empty yours. You have been a busy girl – that is definitely a Little Gem lettuce – enjoy.